Easy-to-implement plans for safety committees and management teams to improve safety performance. To get employees to buy-in to safety, you have to address loyalty, job-satisfaction, teamwork, happiness and motivation. Otherwise, you are going to have to chase your people into compliance. And you will be frustrated. Happy people who love their jobs do better work, get better results and do what is necessary to stay safe. Your workplace doesn’t need more safety rules and procedures. What you need is more of your people to buy-in to the safety program. But, how are you supposed to know how to do all that? and it demonstrated to the employees that they mattered." First, we help you engage in multiple onsite planning strategy sessions. Then, the strategy process where you identify the objectives of your plan, ensure support of the plan by supervisors and managers, and what you want your people to do. Then, you launch. And, we stick with you while you execute and make adjustments as you go. resilience, leadership, service, gratitude, and safety!" Let's talk. Let us deliver a proposal that outlines everything you and your management team need to know to be able to make a decision. Let's get working on a plan together, one that builds momentum. 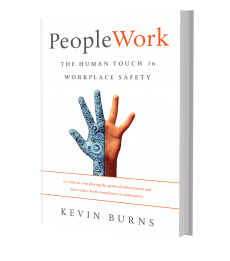 "It lays out the strategies for safety committees and management to connect safety with employees."